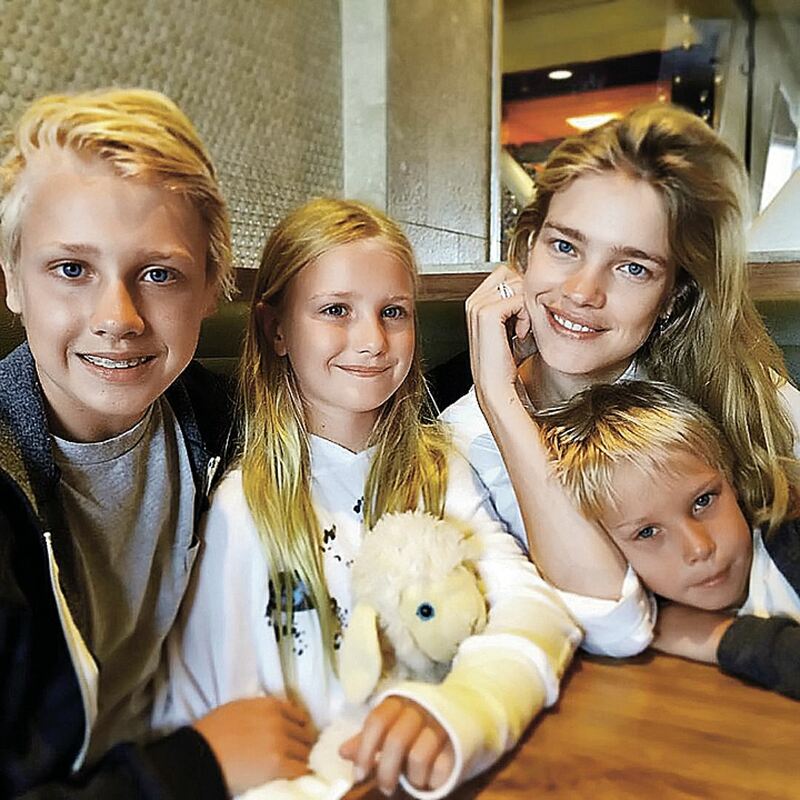 Vodianova will give birth to twins? - The problem of families in which the child grows with a particular diagnosis, is not only the lack of specialists, money, etc., but also people's attitude. These children can be laughed at, even pushed off the children's playground. What should parents do? - I have the answer, it is a very personal (Natalia's sister Oksana suffers from autism -. Ed.). You can smile and say: this is my daughter, she has autism, she is a little different, but she's great. And if you say it with sincerity, not giving person the look, you know... up and down, if you can contain and reduce grievance, which is familiar to me, well ... The conflict will be over. And then I did not know what I should do that. - Of course. Fought, defended, cursed, hated. But now I realize that the most correct way - to find the strength to overcome anger. I was six years old when Oksana was born. I did not know anything about these children. Then I realized she was different. - You can say that you have learned something from her? - I learned everything from sister. Including endless patience. Oksana was a hooligan, to put it mildly. If we left cabinets opened, she pulled cereal, mixed it with clothes. We didn't have washing machine, we hand-washed it. It was hard, it pained. I can not say that I loved her less for it. The family is the most sacred. - You have said many times that there's no hard feelings about a particular situation. You are not angry at those who hurt your sister when she was a child, at your father, whom you met as an adult woman. This is the result of work on yourself? - For this, too, thanks to Oksana. We have always understood it was not her fault. She has some certain baggage, she was born with it - unlike us. That's why I always treat people, realizing that they, too, can have such baggage. For example, you get a taxi and the taxi driver starts to be rude to you. Usually they react like this: "This is your job, take me where I say!" And I'm trying to say: "What a wonderful morning". "The parent - is a god"
- Can you be aggressive, and to use the necessary Russian words? - I am a person who lives in Paris, who is very spoiled anyway. Even if I work very hard, even if tired, like everyone else, I understand my privileges in life. No way, I can not afford it. I'm not an angel. But I can also forgive. Self forgiveness is also important. The main thing, it is necessary to admit your mistakes. - You're five-time mom. It is clear that you have babysitters. But if you ever get tired of parenting experience? - Sometimes I get tired. Especially on a Friday night, when, after a long week I want a little bit of peace. But I say them: "Go the shower, go to sleep!" - You're a strict mother? - Yes, the commandments. And I need to make sure that the child follows these commandments, otherwise he will be punished. This is absolutely normal. If the child does not have a framework, then he does not have love. Child will not tell thanks to his mother for the fact that she allowed him everything. - Your eldest son is 15 years. How to discipline an adult boy? Take gadgets away? - Then you will get gadgets. - You will get everything. - Are you worried about putting your children in the context of Russian culture - books, cartoons? - Very concerned. We watching foreign cartoons in Russian. I try to read for them a lot. It's complicated. But if my eldest son decides to pass Russian as a foreign language, he will pass. - He speaks with an accent? - Yes. When Lucas was born, I was 19 years old. I was very young, lived in America. I talked to my son in Russian up to three years. Then he stopped to answer me in Russian - switched to English. And I decided that it's easier. I worked a lot, I just wanted to be with my son. And so far, unfortunately, we can not switch with Lucas into Russian. He understands that we have the most beautiful girls in the world - I keep telling him that. This is a good incentive for the knowledge of Russian language. But with Neva, Victor, Maxim, and now with Roman I speak only in Russian. Their level of Russian is much higher than that of Lucas. Natalia Vodianova: "It is necessary to admit mistakes". - How to combine work and family successfully? - You know, everything is very simple. I work as a model for no more than a month in the year. My work in charity, of course, for me it is a matter of life. But I can do much from home. I don't fly to America too often. I visit Russia every month while I visit United States four times a year. I visit London every two weeks, but visit it briefly: send chi ldren to school, get on the train, and for dinner already back home. All the kids are very busy antil the evening: the school, and then the piano. I always try to be at home at the weekend. Never rest alone, without children. - But psychologists advise to take a break from the children. - I get a break from my kids at work. There I am the center of attention, the princess. I just have to smile and look beautiful. What woman would refuse such work if it also pays your bills and allows you to do what you love?! I am often asked whether the children have such a question: Mom, why you're not with me, and helping other children? Absolutely the opposite. My work - that's what they are proud of. I hope I will pass the baton to my children in the future. - How do you spend your birthday? - As always, I expect a lot of attention, a lot of love, a lot of flowers. But then, most likely, a family dinner in the evening. - Absolutely. I love cakes. Natalia Vodianova was born on February 28, 1982 in Nizhny Novgorod (then Gorky). Family (Natalia has two sisters) had no money. To earn a living, her mother illegally traded fruits in the street. At the age of 16 Vodianova got into a modeling agency where she was noticed by a scout from Paris. She worked with leading fashion houses (Gucci, Chanel, Calvin Klein, and others.). Actively involved in charity work. She lives in Paris.